Mali Mish - Day 27: Completing the Denver Aluma-Trifecta with the Coors Brewery Tour. Day 27: Completing the Denver Aluma-Trifecta with the Coors Brewery Tour. I don’t want to assume but I suspect we might be the only people who have ever completed the Denver Aluma-Trifecta. If you have never heard of the Denver Aluma-Trifecta, don’t worry, I just made it up. As many of you know, we just attended the inaugural Alumafandango event at Lakeside, CO. We also ate at the original Chipotle Mexican Grill yesterday. Today, we will be visiting the birthplace of the Silver Bullet: The Coors Brewing Company. Before I get into the brewery tour, let me digress. We are back here in Golden not just for free beer. We promised the girls we would take them swimming at the Golden Community Rec Center. 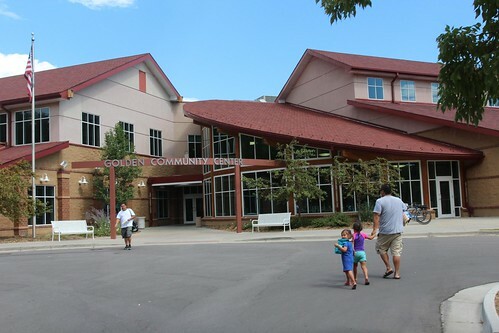 Colorado has some of the best community rec centers we have ever seen. Like the one in Fruita, this one is a beautifully and thoughtfully constructed facility with all kinds of fun things to do. First of all, it is a complete gym with bikes, treadmills, elliptical machines, rock climbing walls and weight rooms. 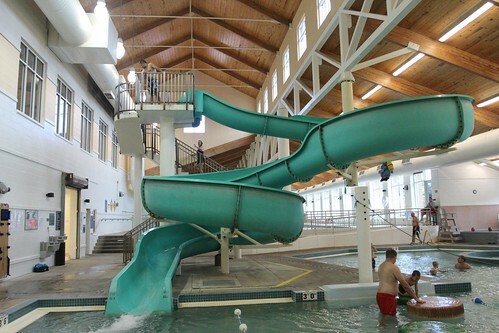 It also has a complete aquatic center with a large, multi-lane lap pool, hot tub, sauna, as well as a recreational pool with a water slide. Look at the size of this water slide. This one puts the one in Fruita to shame. They are also a lot more lenient on what you can and cannot do here. At Fruita, they did not allow anyone on the slide with floaties or life jackets because they assume you can’t swim on your own. Pretty much anything goes here. The best part of these rec centers is you get all of this for a ridiculously low price of $5.50 a day for adults and $2 for kids 5 and under. 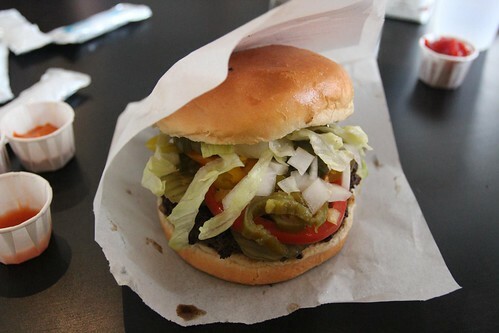 After spending the morning at the pool, we worked up a pretty good appetite so we headed over to a local burger joint we spotted yesterday while driving around called Bob’s Atomic Burger. This is exactly the kind of place I have hoped to find around the country. Local, low key and cheap. I like to think of myself as a connoisseur of burgers. I often judge a restaurant by just the quality of their burgers alone. The ingredients are simple and anyone can make one. But when someone is proud of their burger and they make an effort to make it special, you can taste the difference. Bob’s Atomic Burger has made the short list of one of my favorite burgers so far on this trip. 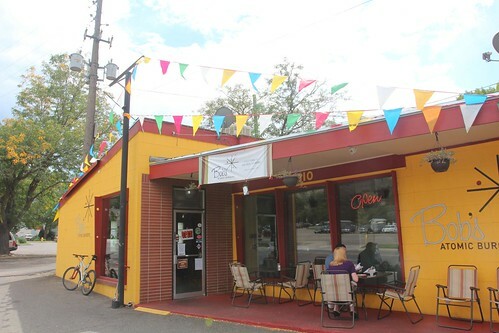 If you are going to check this place out, it is easy to find. It is right across the street from where you park your car to take the shuttle for the Coors Brewery tour. We parked the van in their parking lot and hopped on a bus that takes you briefly around downtown Golden while the driver gave us a little history of the town before pulling into the brewery. 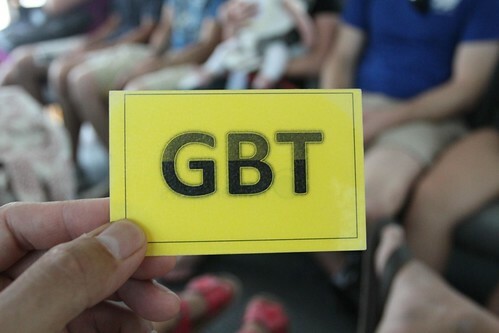 We were given a yellow card that read ‘GBT’. That stands for ‘General Brewery Tour’. If you don’t take the bus in for the tour, you don’t get a card. If you don’t have a card, you don’t get a tour. 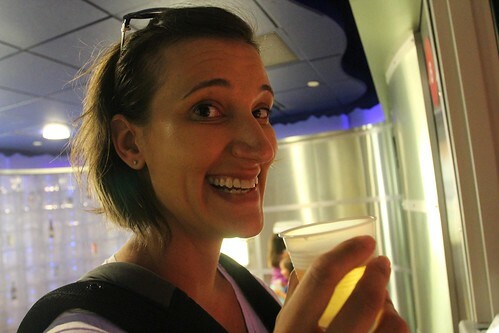 If you don’t take the tour, you don’t get free beer. Are you following my logic here? It basically means, take the bus, get free beer. 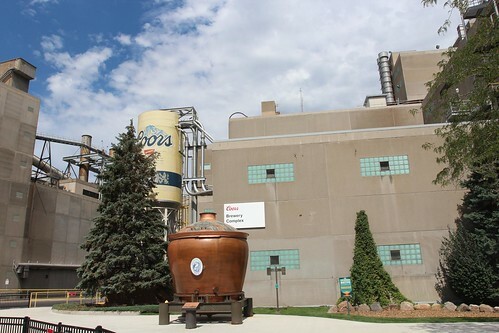 Coors Brewing Company recently became Miller Coors through a series of mergers to become the second biggest brewery in the world. But one thing that was made clear to us time and time again during the tour, is that this is the largest single brewery location of them all. We had to show our ID to get a paper bracelet that will allow us to get the free samples during this tour. You are served an exact amount of beer. A small sample cup in the middle of the tour, and 3 glasses at the end. We were also told that we are not allowed to drink from each other’s beer cups. Someone must have done the calculations to figure out how much beer each person can drink and still drive home from the parking lot legally. 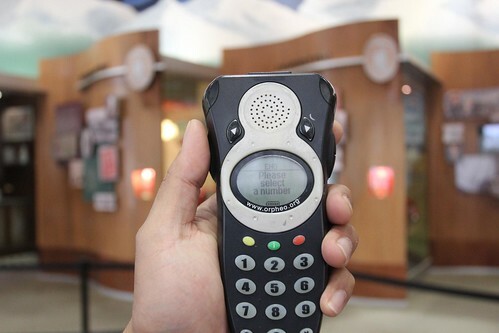 The tour is self-guided and a little listening device is provided to visitors 12 and older. They receive so many visitors here each day, a guided tour is practically impossible. 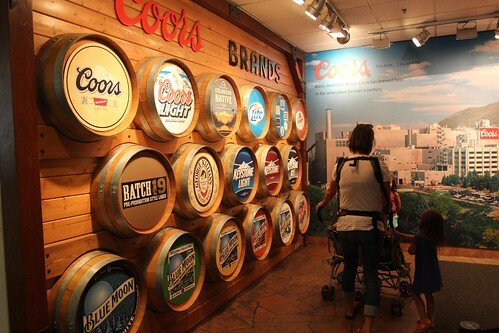 If you didn’t know, Coors makes more than just Coors and Coors light. 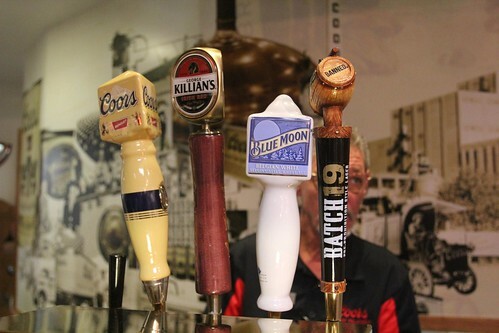 They also make all varieties of Blue Moons, Keystones, Killian’s Red and a new beer called Batch 19 made from a recipe they found that predates the prohibition. 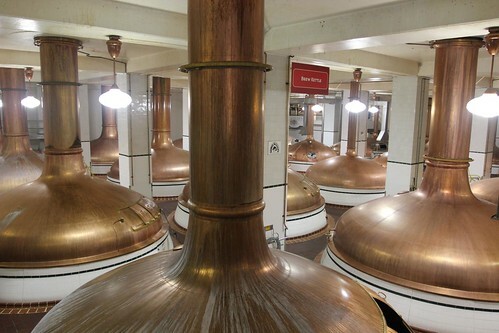 In the first rooms, massive copper vats are used for various stages of the brewing process. Copper is the preferred metal for these containers because they conduct heat well and don’t leave a metallic taste in the beer. 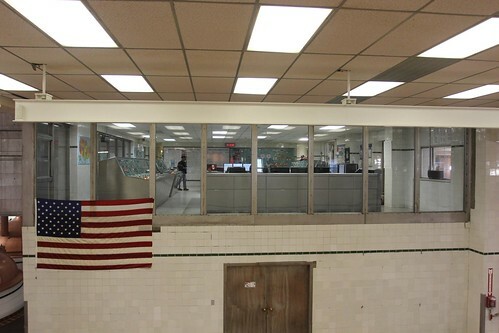 In the middle of all of the copper vats, is their mission control center. Not only are these guys serious about their beer, they apparently are also very patriotic. 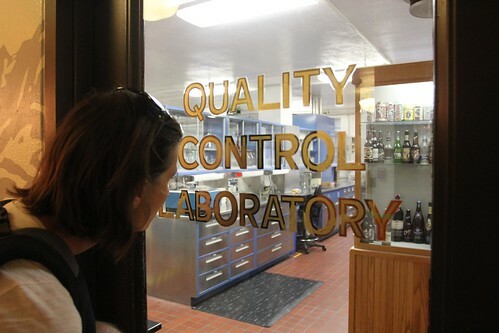 Of all of the jobs here at Miller Coors, this has to be one of the most desirable one: Beer Quality Control. It is not a joke, this place really does exist. 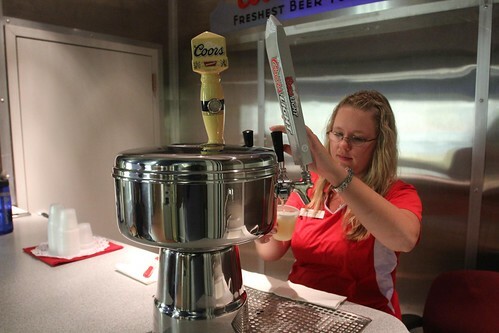 Just around the corner from the Quality Control lab, we found ourselves a little sampling station pouring ice-cold Coors and Coors Light that was just cold-filtered 3 days ago. They make the beer downstairs and bring them right up to here for us to enjoy. The cups aren’t big but look who is excited. They are not kidding about keeping their beer cold around here. 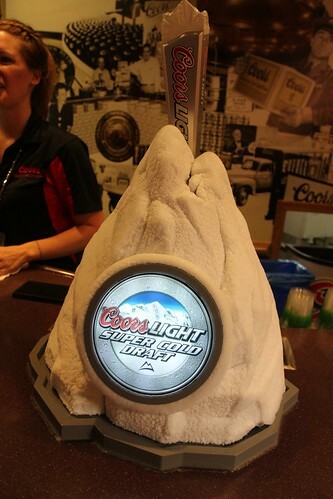 Each drop of Coors Light is cold filtered through a 1-micron membrane so you are also getting the clearest beer possible. 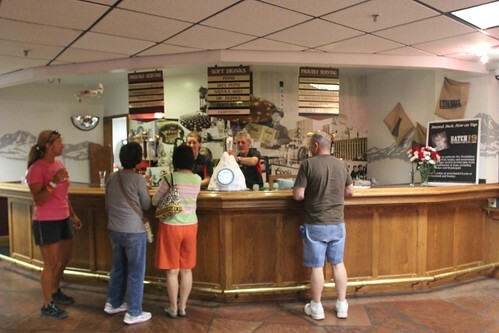 The tour mostly takes you through a series of hallways that have exhibits and display that show you some history and methodology of their beer making at the brewery. Besides the copper vats, window to the Quality Control Lab, the only other glimpse into the beer making process is here at the packing facility. 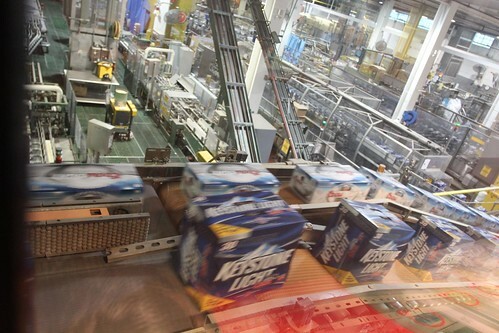 It is here where canned and bottled beers are being loaded into boxes and sent down a conveyor belt to trucks that will deliver them to beer distributors everywhere. And finally, we made our way to the free beers. If you are here just for the free beers, you can actually just cruise right through the tour and make it to the lounge in about a minute. I am sure there are plenty of locals who’s done just that. At the bar, we are allotted 3 glasses of beer and they keep track of them by marking your bracelets that you received when you came in. and of course, Coors Light. This tap is chilled an extra 10 degrees lower than the rest for that refreshing, cold-filtered taste. Yeah, that’s a cold beer. 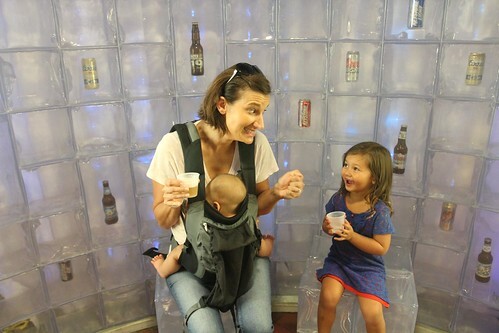 If you were wondering, our little ones were allowed to tour the brewery, they just don’t get to sample the beers. 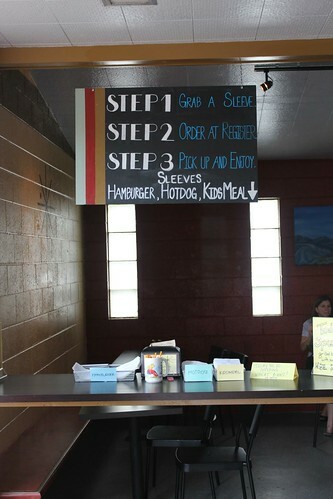 However at the bar, they do offer a variety of soft drinks for them to drink as much as they want. 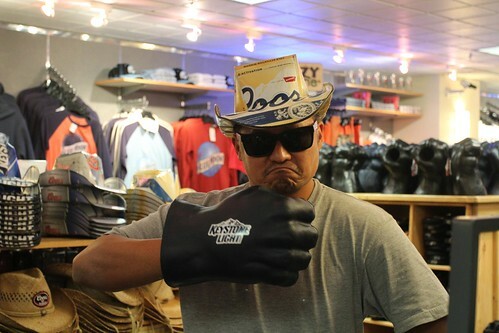 As usual, the gift shop had all kinds of wacky Miller Coors shwag like the beer-box cowboy hat and the big foam hand with a beer can slot. My favorite has to be this insulated 6-pack belt. No, I did not get to buy one. That idea was shot down faster than a speeding silver bullet. Tomorrow we are leaving Golden and starting to head north out of the Denver metro area. Our visit to Denver has been awesome and we can’t imagine what else will be able to top this. 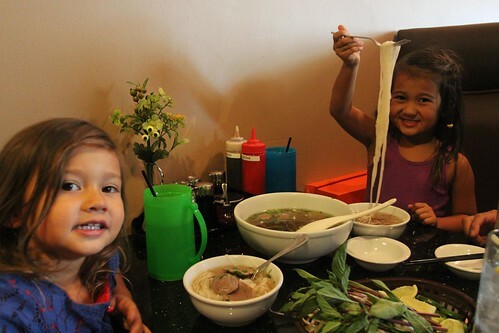 But for now, please excuse us as we have some Pho to eat and another couple of hours of swimming to do back the the rec center before it closes. Day 26: Finally getting to explore Denver. Day 28: From Colorado to Cheyenne, Wyoming. 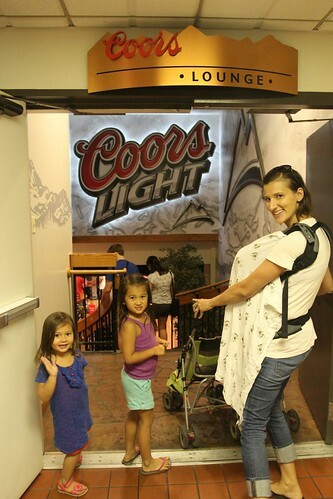 6 Responses to Day 27: Completing the Denver Aluma-Trifecta with the Coors Brewery Tour. Hey! I learned something! 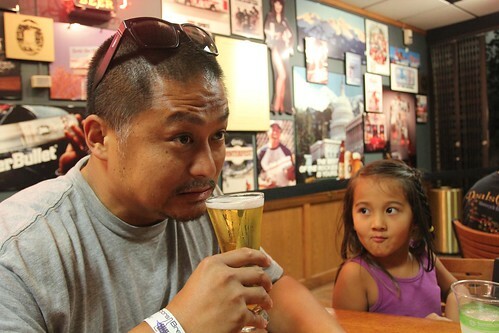 We weren’t going to do the tour because we don’t care for coors… however hubby is a huge fan of Killians! We will be doing the tour now! Thanks for the pics! Did you guys look up the Hammond Factory tour? Great review! Seems more ‘automated’ then when I toured in ’76, with a guide at that time. Back in ‘the old days’ Coors was not available anywhere, only limited states carried the brand. We loaded up our car and headed back to Minnesota where friends eagerly greeted us and paid us kindly for our goods! 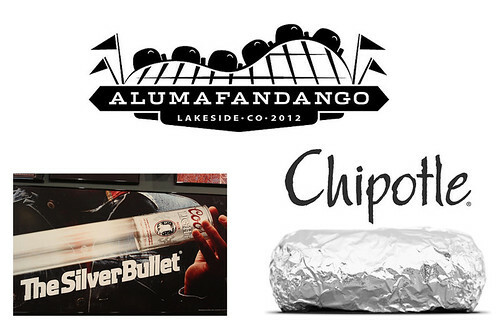 ps – amazing how a can of the Silver Bullet, a Chipotle burrito and an Airstream all look similar! Safe journey! OMG that beer box cowboy hat IS you! 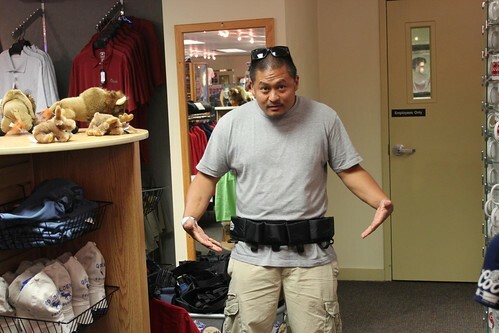 What kind of wife doesn’t let her husband get the insulated six pack belt? A smart wife…thats’ who! Looks like you guys continue to have a blast. Loving the updates. Travel safe! I don’t remember too much of the tour when I went when I was about 8 or 9 it I DO remember the water! That was all they had for the kids to drink but it was VERY good.